Cyclops and Jean Grey. Black Panther and Storm. Vision and Scarlet Witch. Superman and Wonder Woman. Batman and Robin. When superheroes meet and fall in love, it is cause for celebration. 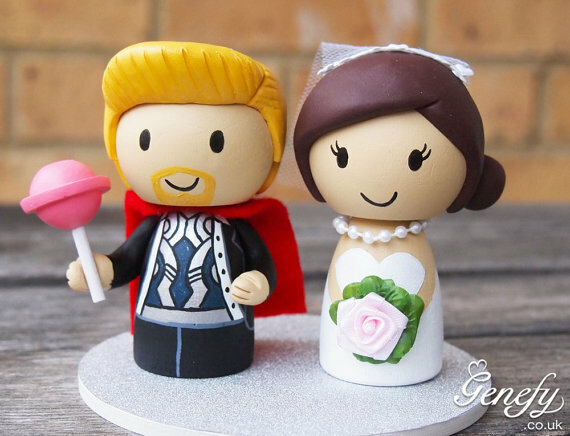 For newly engaged couples seeking a way to incorporate their shared love of one particular superhero or superheroes in general, a superhero wedding theme is an idea easily adaptable for any type of nuptial celebration. First, set a budget and determine the number of guests. 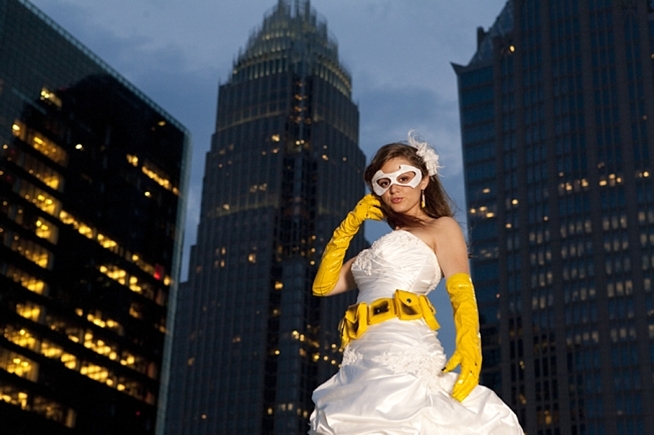 Come to an agreement on how far to carry the superhero wedding theme. Keep in mind it is not always a great idea to encourage guests to come in full costume. The possibility of future in-laws wearing tights and capes is worth a discussion – some things can never been unseen. One compromise is to keep it tame during the ceremony, letting the fantastic fun loose during the reception. Set things in motion with the invitations. 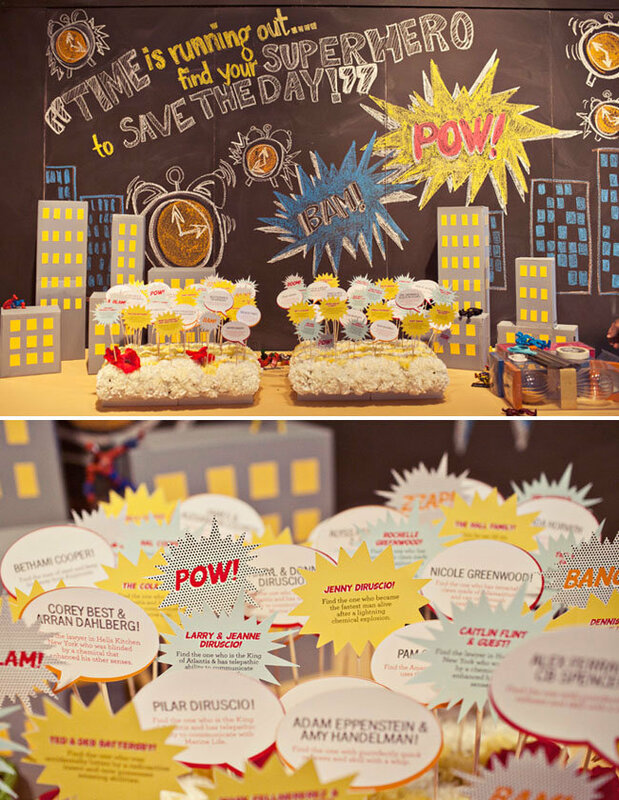 Guests will be curious and excited about a superhero wedding theme. Create a personalized comic book with a brief story about the bride and groom along with all of the pertinent wedding details. A budget-friendly version of this is to have an artist draw a comic strip version of the bride and groom as superheros for the front of the invitation with more traditional details included inside the card. Most women dream of wearing a beautiful wedding gown. However, there is no reason a traditional dress cannot be made a little bit “super.” A visit to any online store specializing in costume merchandise will reveal superhero garters, lingerie, socks and even shoes to fit the theme without detracting from the gown. Brave brides might opt to sport a belt fashioned after Wonder Woman’s Lasso of Truth or her golden arm-cuffs. Men might enjoy sporting action figure boutonnieres with appropriate flowers attached. They, too, can opt for subtle superhero garb. 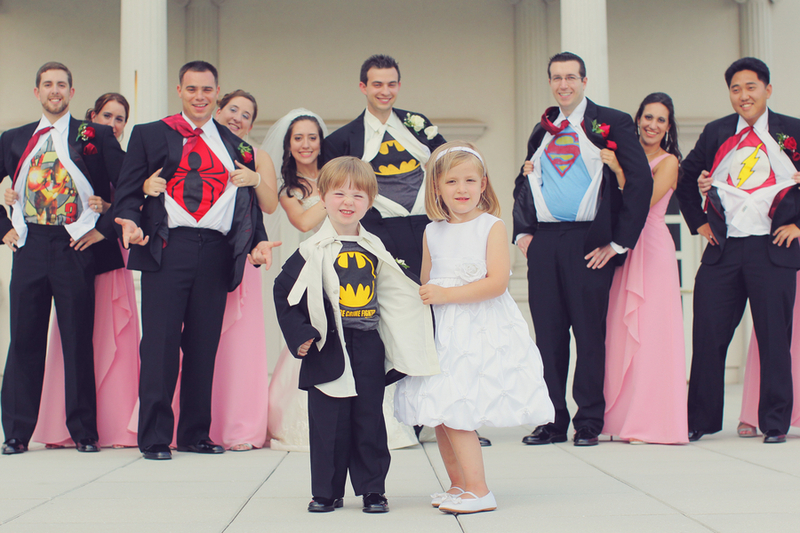 The groom can wear themed boxers and his favorite super hero t-shirt under his tuxedo. Don’t forget to check out superhero cuff links, rings and other jewelry. The reception is the time to really make a statement. Have a back drop where guests can take photos – Gotham City? Plain white with thought bubbles painted at head height? 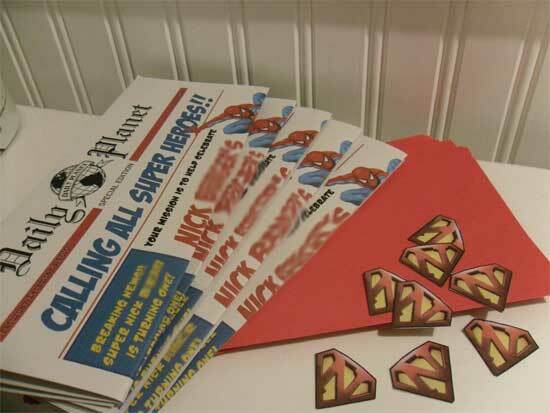 Have props like capes and superhero gadgets available nearby. 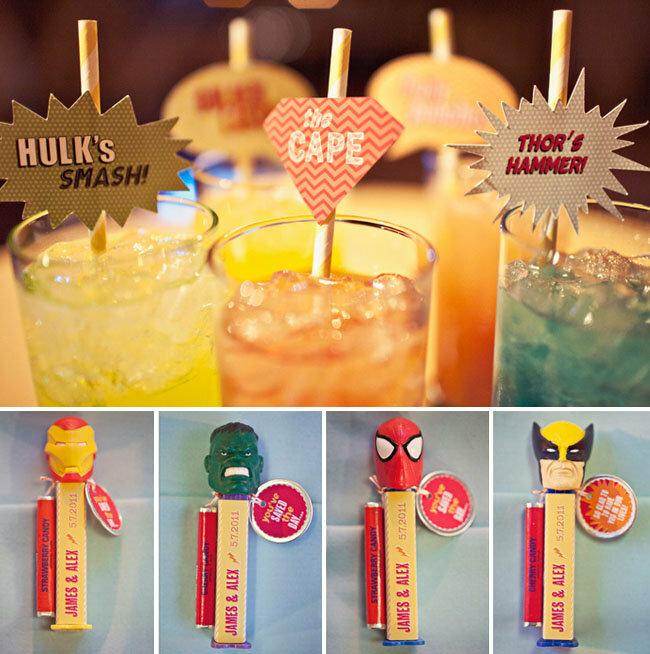 At the bar, create themed drinks with superhero ice cubes and straws with cartoon markers. 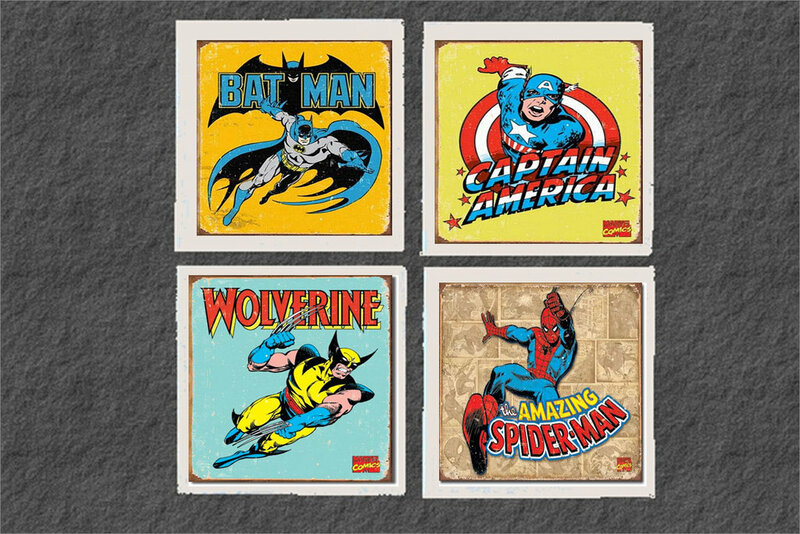 Top it off with super hero theme coasters. The wedding cake offers countless possibilities. Each layer of the cake can be decorated to represent a different super hero. A plain cake can be covered with fondant symbols and BAM! POW! blurbs. For a black-white-red Spiderman wedding, feature white cupcakes with delicate spider webs on top. Don’t forget the guest favors. Superhero Pez dispensers are always a hit. For something more elaborate, assemble bags with Pez dispensers, masks, silly string and small flashlights with a Bat Signal taped on the lens. Skip the Macarena or the Chicken Dance – get guests dancing to the Batman TV theme song and a host of other theme songs covered by artists of every genre. Hong Kong Phooey by Sublime will bring everyone to the dance floor. Put the best man to work compiling a play list. If there will be a live band, ask if they will cover one or two favorites. Thanks to vanessajoy, jaggerphotography and dpersonettphotography for providing the beautiful photos. Please check them out for more eye candy.